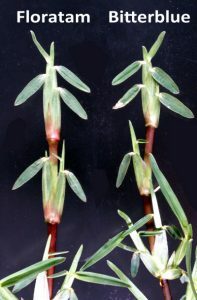 After discovery of damage to Floratam St. Augustinegrass by SCMV (Sugarcane Mosaic Virus) there is renewed interest in the older cultivar Bitterblue St. Augustinegrass. Both cultivars have long been used in Florida lawns. Plant pathologists believe that Bitterblue and other cultivars may be resistant to SCMV. The leaf collar of Floratam is pinkish unlike Bitterblue which is yellowish-white. A few days ago, I read that there is “no description” of Bitterblue. That is not accurate because I have published research specifically to identify Bitterblue, Floratam, and other St. Augustines. Therefore, this page describes how to identify Floratam and Bitterblue. I also report the earliest use of Bitterblue according to Florida sod producers from the 1930s. Floratam and Bitterblue are bluish-green St. Augustinegrasses in contrast to the Gulf Coast Group and the Longicaudatus Group which includes Florida Common and Roselawn. There is considerable overlap of vegetative measurements for leaves and stolons. 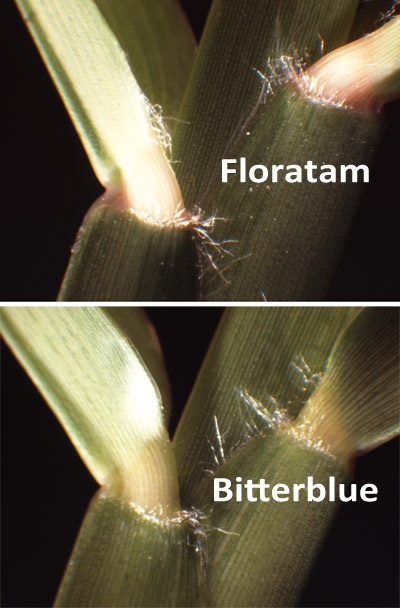 Nevertheless, Floratam can be distinguished from Bitterblue 93% of the time by the leaf collar which is pinkish on Floratam and yellowish-white on Bitterblue (Busey, 1986). Floral region length of Floratam averages 111 mm which is significantly longer than Bitterblue at 71 mm. This gives seedheads of Bitterblue a more condensed appearance. Spikelet length of Floratam is 5.6 mm on average, significantly larger than Bitterblue at 4.8 mm. The length of the mature spikelet is an excellent way to distinguish Floratam and Bitterblue. According to a key to cultivars, 5.2 mm is an effective line of separation between Floratam and other cultivars (Busey, 1986). During the depths of the Great Depression, Palm Beach and Miami Beach presented a market for sod from pastures, sometimes cut while cattle were still grazing. Sod was cross-cut by pulling, by mule or tractor, a frame with 4 or 5 disk coulters. The resulting, marked 1 foot x 1 foot squares were dug by hand with a shovel or scooped instrument called an “idiot spoon.” The sod was pitchforked onto small, 1.5-ton trucks, driven over bad roads, and sold to rich people for 2-3 cents per square foot (R. R. Hammer and Jack J. Kirkland, personal communications). The most contemporaneous, first-hand account of Bitterblue origin was by Ralph Hammer, that sprigs of Bitterblue were obtained from Pompano Beach but may have had a Fort Myers connection. Floratam stolons may seem a little larger than Bitterblue St. Augustinegrass. In 1912, Ralph Hammer, age 2, moved with his large family to Zona, Florida (soon renamed Davie) from Alberta. He described crossing the South New River Canal, which flows to the Atlantic Ocean, by barge and cable, before the first bridge was built in 1917. Once, crossing through the canal on horse-drawn wagon with his dad William, wooden cargo boxes shifted in the bed due to buoyancy. Ralph said that the canal was later deepened by steam shovel. St. Augustinegrass sod was produced in Davie before 1920 by Henry Minton. By 1928 or 1930 Ralph saw sod on trucks in Miami. Because of the pieces’ thick base, Ralph thought that they had been grown on marl, possibly in the Homestead area. My idea is that this could have been sod produced by the Resmondos near the Miami River south of the present Miami International Airport. After graduating from High School in 1929, Ralph worked in Davie orange groves. He then formed a partnership with F. N. Chaplin, the Chaplin-Hammer Sod Co., and cut sod from the Chaplin Dairy. After marrying Anna Elida Griffin in 1934, her parents William Alfred “Al” and Anna Dolores Zanetti Griffin died in a 1937 car accident. Therefore, Ralph and Anna Elida raised her brothers, with whom Ralph later formed Griffin Brothers Co. They continued to produce Bitterblue St. Augustinegrass sod from the 1940s through the end of 1900s west of present ghost town Deem City, along US-27 in Palm Beach County (maximum population 2). I visited the farm with Howard Griffin in 1984 (which Howard called the “Tarreytown Farm”) when they were doing more visible rock mining than sod. Ralph Hammer reported that in 1934 he and Tiny Chaplin (Boston Bees pitcher and son of grove owner F. N. Chaplin) obtained sprigs of Bitterblue from the owner of an orange grove in Pompano Beach for $1 per burlap bag (Ralph Hammer, personal communications October 9, 1984 and December 3, 1984). Ralph had also heard about a man in Fort Myers who may have been growing Bitterblue at the same time. Ralph’s brother-in-law Howard Griffin said that the man in Delray Beach or Pompano Beach from whom Ralph had obtained Bitterblue said that it had come from the University of Florida in Gainesville (Howard Griffin, personal communication, November 20, 1984). Floratam and Bitterblue show vegetative differences such as length of floral region (artist Penny Longo Silverman). In 1926, Jack Kirkland was helping construct Tamiami Trail, the first road across southern Florida. He met his future wife Mabel, from Nova Scotia, whose father also worked on Tamiami Trail, at the work camp at Pinecrest, Monroe County, Florida, now a ghost town. Jack was a tractorman, pulling the drilling rig, to make holes to insert the dynamite to blow up the rock. Floating dredges excavated the exploded rock for the road. The dredged canal supported the floating barge to continue dredging across the Florida peninsula. In 1933 or 1934, Jack Kirkland was a foreman producing sod in the Davie farm of James H. “Jimmy” Bright, who introduced Brahman cattle to Florida and was involved in Thoroughbred horse racing and later donated land to the City of Hialeah. Jack said that in 1935, Jimmie Bright brought bags of Bitterblue from Belle Glade, in the back of a pickup, for planting (Jack Kirkland, personal communication, May 4, 1988). Jack’s son Elmer Kirkland confirmed that Bitterblue was from Belle Glade (Elmer Kirkland, personal communication, November 24, 1987). The Kirkland family moved by 1957 to Samsula near New Smyrna Beach, where they continued producing sod for generations. James E. Ousley said that Bitterblue came from the owner of an orange grove in Fort Myers, which was visited in 1936 by Ralph Hammer and Tiny Chaplin. They “later purchased 40 bags of sprigs from a grove owner in Pompano Beach, Florida, who had obtained some of the Ft. Myers grass” which was first marketed around 1940 (Ousley, J. E. 1963). Jimmy Blackledge also said that Bitterblue originated in Fort Myers (Jimmy Blackledge, personal communication, fall 1979). An indirect reference was by sod producer Ed Davis of R & D Sod, Okeechobee who told me, through Kenneth Resmondo (of Evergreen Sod in Palm Beach County) that Ken’s uncle Ruben Resmondo (brother of Louis Resmondo) planted Bitterblue in 1935 near NW 7th Street and Red Road (NW 57th Ave.) in Miami, near the Miami River, and that Mr. Foster, owner of Maule Industries, was harvesting sod there in 1947 (personal communication, Ed Davis, February 5, 1988). Bitterblue was generally believed to have gotten its name from the observation that grazing cattle rejected it when ‘Florida Common’ was accessible (Dr. Roy A. Bair, personal communication). Initially it was thought to be resistant to the southern chinch bug. But that was not the case. Bitterblue was “corralled” by the University of Florida in 1960, to reduce confusion in the trade, and released under the name ‘Floratine’ (Dr. Gene Nutter, personal communication). Floratam was a seedling discovered and released jointly by the University of Florida and Texas A & M University in 1973. Because of its extremely coarse appearance, Floratam was nearly discarded (Dr. G. C. Horn, personal communication). Floratine was certified at least from 1969 through 1981 by the Florida Department of Agriculture and Consumer Services, Division of Plant Industry (DPI). Certification records were reported by Jesse K. Condo, Hugh W. Collins, Jr., and Richard A. Clark of DPI showing acreage over the years. In 1973 was released Floratam St. Augustinegrass, jointly by Texas A & M University and the University of Florida. Because of its superior characteristics in resistance to atrazine and the southern chinch bug, by 1980 Floratam, identified from samples by discriminant analysis, represented 77% of St. Augustinegrass sod acreage and 21% of lawn acreage compared with 31% for Bitterblue (Busey, 1986). Confusion occurred in the similarity of names Floratam and Floratine, particularly for truckers who transported sod, often communicating over static-prone CB radios. So the names sounded almost the same. Floratine as a name fell into disfavor and the grass was again marketed as Bitterblue. Allen, R. J. and R. W. Kidder. 1971. Origin and history of Roselawn St. Augustinegrass. Proc. Soil Crop Soc. Florida 30:354-360. Busey, P. 1986. 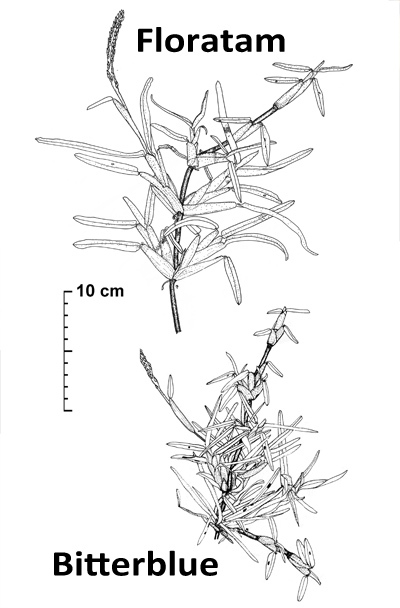 Morphological identification of St. Augustinegrass cultivars. Crop Sci. 26:28-32. Busey, P. 2003. St. Augustinegrass. pp. 309-330 in: Casler, M. D., and Duncan, R. R. (eds.) Biology, breeding, and genetics of turfgrasses. John Wiley & Sons, Inc., Hoboken, NJ. Busey, P. and R. W. White. 1993. South Florida: A center of origin for turfgrass production. Int. Turfgrass Soc. Res. J. 7: 863-869. Busey, P., T. K. Broschat, and B. J. Center. 1982. Classification of St. Augustinegrass. Crop Sci. 22:469-473. Horn, G.C., A.E. Dudeck, and R.W.Toler. 1973. ‘Floratam’ St. Augustinegrass: A fast growing new variety for ornamental turf resistant to St. Augustine decline and chinch bugs. Florida Agric. Exp. Stn. Circ. S-224. Johnson, Charlene R. 2014. Central Florida Thoroughbreds: A history of horses in the heart of Florida. The History Press. Nutter, G.C., and R.J. Allen, Jr. 1960. Floratine St. Augustinegrass: A new variety for ornamental turf. Florida Agric. Exp. Stn. Circ. S-123. Ousley, J. E. 1963. Why I went certified. Proc. Florida Turf-Grass Association 11:133-135. Rosenberger, A. M. and P. Busey. 1992. St. Augustinegrasses. Proc. Florida State Hort. Soc. 105:227-230. White, R. W. and Busey, P. 1987. History of turfgrass production in Florida. Proc. Florida State Hort. Soc. 100:167-174.